Wedding rings are one of the oldest traditions going. If you’re getting married soon, you may be thinking about which rings to buy and how much to spend. With so much choice on offer nowadays, shopping for the perfect ring can be a minefield. This guide will hopefully help you to find the right ring without any hassle at all. Wedding rings are a symbol of everlasting love. They are usually plain, and the seamless circle is a sign of an unbreakable, loving relationship. Although there is a host of different designs and materials on offer now, wedding rings in their simplest form date back hundreds of years. It is believed that wedding rings were introduced by the Romans. They are traditionally worn on the ring finger of the left hand. This hand was chosen due to the presence of a vein affectionately know as the ‘vein of love’. The ring sits over the vein, which travels directly to the heart. 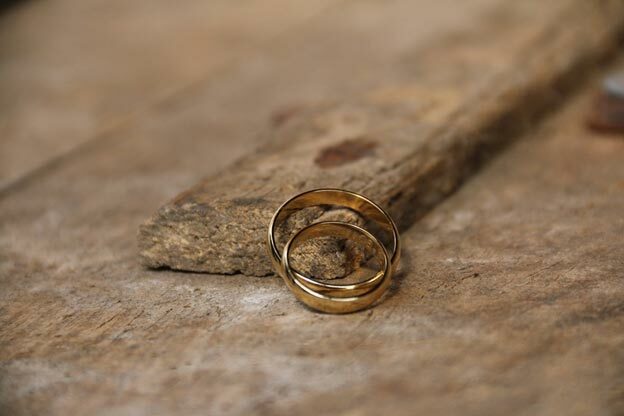 Wedding rings have always been worn by women, but they are less common for men. It is only fairly recently that male rings became popular. If you’re getting married, it’s up to you whether or not you wear a wedding ring. Many men like to have a ring once they’re married, but it’s a matter of personal choice. Which wedding ring should I buy? Wedding rings come in all different materials these days, and you can choose from different styles. Most people tend to go for traditional wedding bands, which are plain. However, it is possible to custom-design wedding rings or buy pieces, which are embellished with jewels. Most brides tend to opt for the same material as their engagement ring. You can order gold, platinum, silver, white gold and titanium wedding bands. If your partner is having a ring, it’s common to go for the same material. When you’re choosing wedding rings, it’s always a good idea to try them on. For women, it’s beneficial to try the wedding band with the engagement ring. If you have a large ring or your ring is very detailed, a plain band may be best. If wedding bands you try in jewellery stores don’t fit properly with your engagement ring, it may be best to custom-design one. Try a range of bands on and see which you prefer. Some people opt for a slender band, while others prefer a thicker ring. It’s always a good idea to shop around for wedding bands. Often, you’ll find that prices vary significantly even when the rings are essentially the same. You don’t need to rush out and buy a wedding ring as soon as you get engaged. But it is worth bearing in mind that you may need to get your band altered. Rings come in different sizes, but your size may not be in stock. Give yourself at least a few weeks to order a ring just in case it needs resizing. If you have very small or large hands, it’s particularly important to plan ahead. Buying wedding rings is an exciting part of the wedding planning process. Shop around, have a look at some different styles and give yourself time. You could even look to get it engraved to make it that extra bit special. Make sure you get a photographer to take a good up close picture of the rings to capture the moment. Have a look at photographers such as Seattle Wedding Photographer to get some ideas of the styles of pictures you could get! Buying your wedding ring ahead is indeed very important. I remember when I got married we had to send our wedding bands back twice in order to get them resized. We received them back just 24 hours before the ceremony. Do not want to go through such an anxiety again. Thankfully everything went well.